We stopped in Independence, Missouri today to visit the Harry S. Truman Library and Museum. 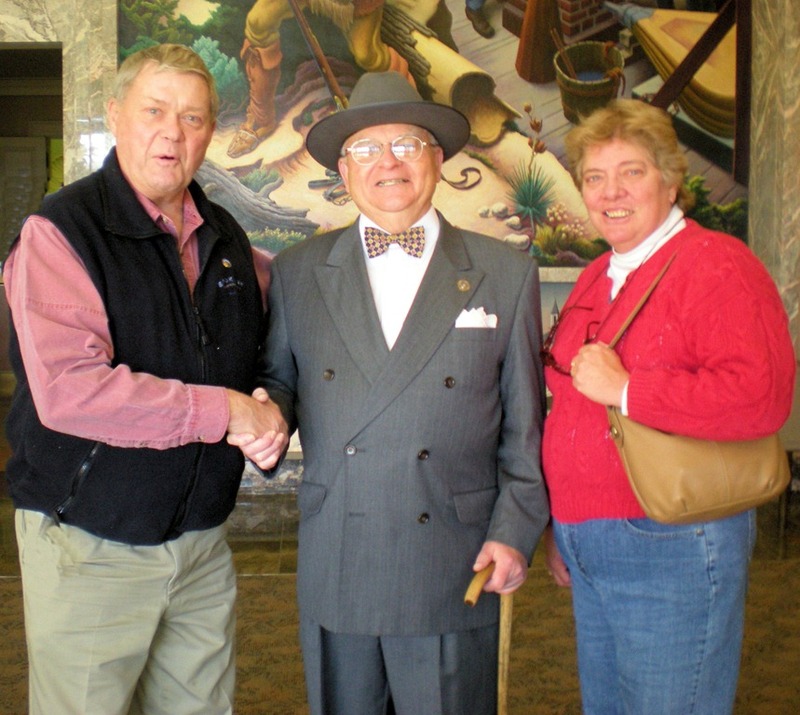 Ever the politician, “Harry” was happy to pose for pictures with Judy and Bob. Portrayed by historian Niel Johnson, the former president greeted visitors and discussed the challenges he faced while in office (1945-1952) including North Korea. Isn’t it interesting that six decades later the same challenge remains a major world concern? Later in the afternoon “Harry” held an impromptu news conference, deftly fielding questions from museum visitors. The AAA Tour Book recommends allowing 2 hours minimum for a visit to the Truman Library and Museum. We would recommend a half-day, after two hours we needed to hit the road knowing that we had only completed a cursory overview. Upon entering we were told about the scheduled showing of two films. Unfortunately we were not told there was a great deal of redundancy between the films. With limited time we wish we had only seen one of the movies and had more time in the permanent exhibits. A 15-minute introductory movie relates Truman’s life up to his inauguration and exits into the museum’s extensive core exhibit, Truman: the Presidential Years. 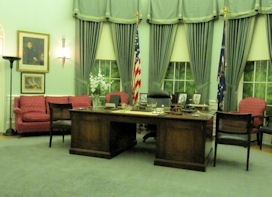 The replicated Truman oval office includes the famous “The Buck Stops Here” sign atop the desk.